Protect your indoor air quality with expert acoustic ceiling removal in Palos Verdes CA. Whether you’re talking about a textured acoustic ceiling or tired old acoustic ceiling panels, there is more than just an ugly ceiling to worry about. These materials may very well be made from dangerous asbestos fibers. 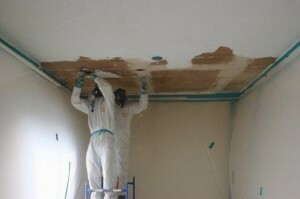 To eliminate the danger posed by an asbestos ceiling, all you have to do is call AQHI Inc. We will complete a fast and thorough acoustic ceiling removal in Palos Verdes CA for you. Any kind of asbestos-containing material presents a serious health hazard because if the material becomes damaged, asbestos fibers can escape. When inhaled, these fibers can cause serious health problems like mesothelioma and lung cancer. In the case of an asbestos ceiling, the situation is especially worrisome because the fibers will be raining down from above. This means they start out airborne and can remain so for days. Acoustic ceiling removal in Palos Verdes CA helps reduce contamination by removing the potential source of any asbestos fibers. However, you must choose a quality contractor for this to be true. A DIY job or work done by an inexperienced contractor can actually spread contamination from the room with the asbestos ceiling to other parts of your property. AQHI Inc. has the skills and the experience required for a safe and successful acoustic ceiling removal in Palos Verdes CA, and we have the certifications and the long list of satisfied clients to prove it. We carry full coverage insurance and we promise to leave your property clean after work. To get a quote on acoustic ceiling removal in Palos Verdes CA or to inquire further about our qualifications, please contact us at 800-481-8080. Our asbestos removal office for Acoustic Ceiling Removal in Palos Verdes CA is open Monday through Friday between 8:00 AM and 5:00 PM and closed for lunch from noon to 1:00 PM. With advance notice, projects can be scheduled for weekends, early mornings and evenings.